The Days of Johann, an agility dog! : Here's a great way to support the AKC/USA team in their quest for Gold at the FCI Agility World Championships! Here's a great way to support the AKC/USA team in their quest for Gold at the FCI Agility World Championships! How cool! Here's a great way to support the AKC/USA Team and their quest for Gold at the FCI Agility World Championships coming in October! 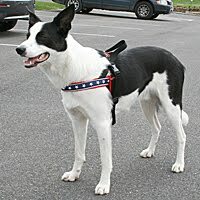 Clean Run is exclusively selling a very cool version of Gracie's absolute favorite ComfortFlex Sport Harness, all decked out in Red, White and Blue! We love this harness because it doesn't ride up on Gracie's neck, giving her great range of motion on her front legs to prevent injury. It's super easy on/easy off, and doesn't rub, even on our longest hikes. And it's come in very handy on occasion when Gracie has to pull Mum up a steep hill. Now all we need is a pulse oximeter to keep tabs on Mum, during our super long hikes, BOL! The ComfortFlex Sport Harness is the most popular harness Clean Run sells. And for a limited time all net proceeds from the sale of these harnesses will be donated to the AKC/USA World Team travelling to Rieden, Germany, for the FCI Agility World Championships, October 1-3, 2010. The harness is red with white nylon trim and navy with white stars ribbon. Get yours while supplies last!